A very boring morning, completing jobs such as laundry and having films playing on the TV in the background which probably proved more distracting than we wanted and made our jobs twice as long! It wasn’t necessarily a bad thing as we were beginning to feel the pinch of doing things in Cambodia – it reminded us of Sri Lanka, with its equally high prices for tourist activities, but with the knowledge that (as we begin to come to the end of our trip) that we had significantly less money than we did back then! 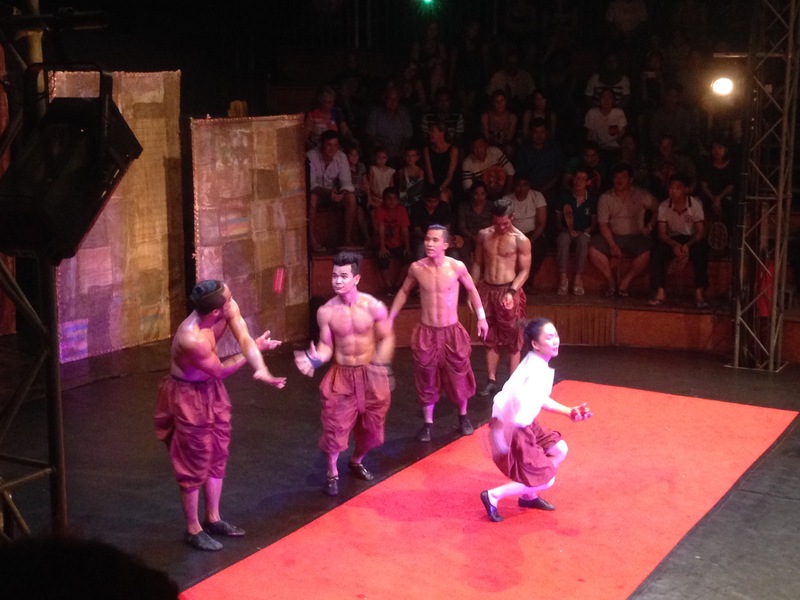 Having had a low key day, we decided to treat ourselves to tickets to ‘Phare’, the Cambodian answer to Cirque du Soleil. 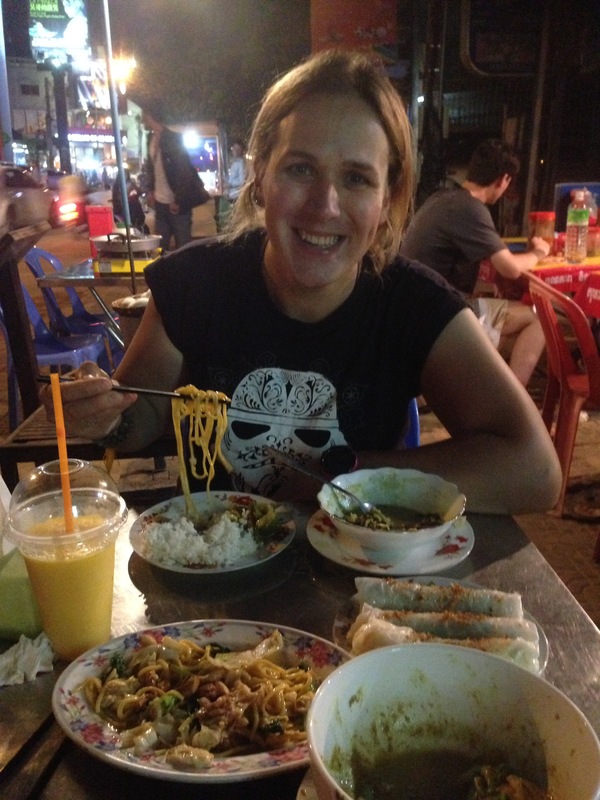 We walked into town and ate some food at a street cafe, drinking the strangest mango shake I’ve ever tried – Jayne reckons it was pink because of the powered milk… I think it was just a random mix of whatever fruit she had left over with some food colouring! The food was good anyway and it filled our bellies, which was the main thing. Another 2km walk outside of town, we got to see a completely different side to Siem Reap. Dark roads, empty pubs and stray dogs seem a million miles away from the bustling businesses at Pub Street. Arriving at the big red topped tent, we picked up our tickets and were led into the gift shop on the way to the theatre. The shop was full of handicrafts made by individuals from the circus association and some of the items were truly beautiful… But had a beautiful price tag to match! So, we window shopped for a bit before we headed outside and waited to be seated. 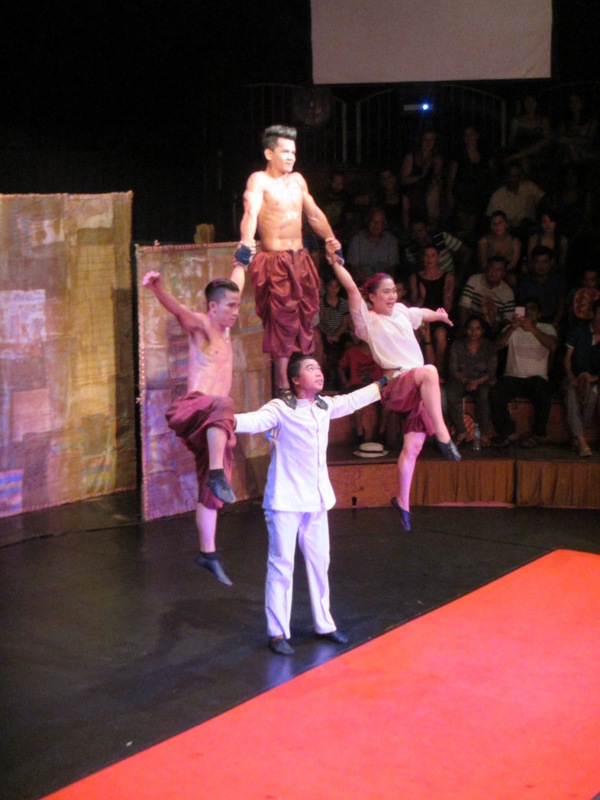 ‘Phare’, the Cambodian circus, is an offshoot project of Phare Ponleu Selpak (Association), which translates into “Brightness of the Arts” in English. PPS Association is a non-profit, non-governmental association founded in 1994 by eight young Cambodian ex-refugee artists in Battambang Province. It serves as a facility to help vulnerable children, young adults and their families, build the careers of Cambodian Artists, to revive Cambodian art scenes, to make worldwide arts connections with Cambodia and to contribute to the artistic, educational and social programs of PPS Association. Several generations of performers have graduated through Phare’s original Battambang campus and have gone on to perform in international shows around the world. Many of the performers have deeply moving personal stories of abuse and hardship, making their talents a triumph against the odds. 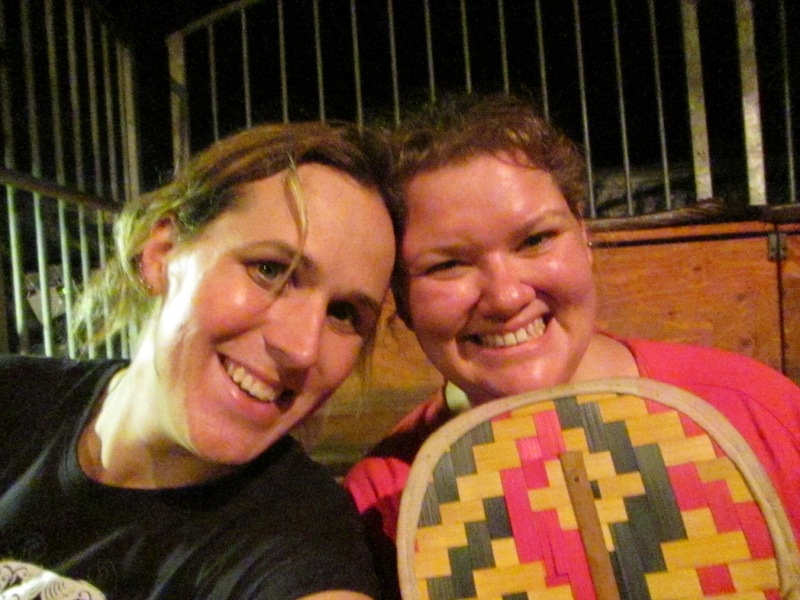 Being given a bamboo fan and shown to our seats, we waited for the performance to begin by watching tourists try to sit in more expensive seats than their tickets allowed. Hilarious watching them try to blag their way to a better view with the Cambodian stewards being comically funny at basically implying that they had bought cheap tickets and therefore had cheap seats! The show we saw was called ‘Influence’. Influence mixes drama, circus and puppetry to explore struggles for power and survival. From primordial organisms battling in pre-historic jungles to an ancient king being manipulated by external forces or a runner tripping his competitors to win a race; all seek to triumph. The characters of Influence dominate and are dominated, trick and are tricked, but ultimately discover their own strength and find unique place in the world. 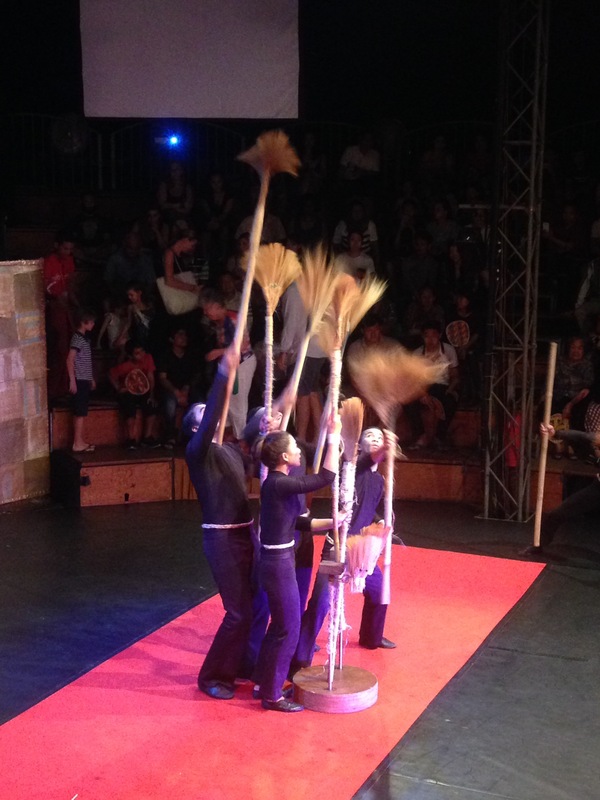 The Phare circus was an incredible hour of traditional and modern theatre, music, dance, acrobatic, athleticism, juggling and contortion all beautifully choreographed and performed in stories about Cambodian lives and society. The smaller acrobat, who clearly knew he was good looking, made everyone laugh as he jumped into several people’s laps and got them to cool him down with their bamboo fans. Having seen several Cirque du Soleil shows, what was particularly nice about ‘Phare’ was that it wasn’t as slick – batons got dropped, juggling was fumbled but it didn’t matter. In fact, it made it better! There was a real sense of having your heart in your throat as they performed their acrobatics – for that and so many other reasons it was fantastic! It really made us feel good about our entrance ticket price as it feels like it’s going to a good cause. We walked back into town, stopping at Blue Pumpkin cafe en route to pick up some more bread pudding (it is incredible and I’m going to miss it when we leave Siem Reap!). Deciding that I was too tired to walk all the way back to the hotel, I convinced Jayne to get a TukTuk back. Laughed at the first one who wanted $5 for the 2km journey and just kept walking until we found one who gave us the right price of $2. Made it easier for him by getting him to drop us off at the hospital and walking down the road to our hotel.